Creatine Monohydrate, CarnoSyn® (Beta Alanine), L-Arginine Alpha-Ketoglutarate, AgmaPure® (Agmatine Sulfate), Caffeine Anhydrous, N-Methyl Tyramine HCI, Choline (Choline Bitartrate), Hordenine HCI, Yohimbine HCI, Synephrine HCI, & Higenamine HCL. Sucralose, Citric Acid, Silica, FD&C Red #40, Natural And Artificial Cherry Lemonade Flavor. This product is only intended to be consumed by healthy adults 18 years of age or older. Before using this product, consult with your physician if you are using any prescription or over-the-counter medication or if you have any pre-existing medical condition including but not limited to: high or low blood pressure, cardiac arrhythmia, stroke, heart, liver, kidney or thyroid disease, seizure disorder, phychiatric disease, diabetes, difficulty urinating due to prostate enlargement or if you are taking an MAOI (Monoamine Oxidase Inhibitor) or any other medication. This Product contains caffeine and stimulants, avoid taking stimulants from other sources including Coffee, Tea, Soda and other Dietary Supplements or medications. Discontinue use and consult your health care professional if you experience any adverse reaction to this product. Do not exceed recommended serving. Do not use if safety seal is broken or missing. Do not use for more than 5 out of 7 consecutive days. This product may contain ingredients banned by certain sports organizations. USER ASSUMES ALL RISKS, LIABILITIES OR CONSEQUENCES RESPECTING TESTING. KEEP OUT OF THE REACH OF CHILDREN AND PETS. WARNING: 400 mg Caffeine Per Serving. Do not exceed the recommended dosage. 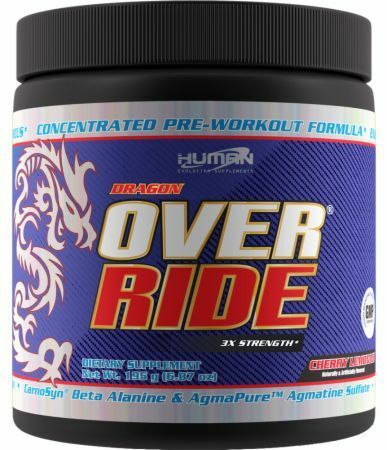 Override uses the hottest ingredient in the market, Agmatine to support nitric oxide and give you the skin tearing pumps you expect in a pre-workout. 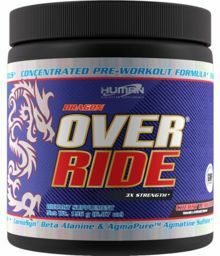 Extreme Override does that without all the carbohydrates and fillers of other nitric oxide products on the market. This product is a one-of-a-kind! Try it once and you'll be a fan for life.